Honey Pai bees are now located at Rotoiti but shortly I am hoping my guests will be blessed with some golden delights. The cottage is a 3 bedroom house with an indoor outdoor flow is perfect for summer BBQ’s or soaking up the winter sun. There is plenty of space in the back yard for the kids and a fully enclosed yard for the doggies. The decor is thoughtful, fresh and modern. As soon as you walk in you know you’re on holiday. It’s your home. Eveything is crisp, warm and cosy. The German double glazed joinery means you’re safe and secure and the heating is fantastic. As is the air conditioning for that summer heat wave. A brand new kitchen awaits those wannabe MASTER CHEFs plus the large deck and BBQ to choose from. The Redwoods - Mountain biking paradise – plus the Whakarewarewa Living Maori Village are right on your doorstep. It’s a thermal wonderland. Bubbling mud pools and the famous Pohutu Geyser. There is a SMART TV, Freeview, sound bar with Bluetooth and free ulltrafast WIFI. PETS are welcome so please enquire. There is a lovely backyard with fencing all around. SUMMER HEAT WAVE - we are now equipped with the latest state of the art AIR CONDITIONER. WINTER HEATING - by way of a powerful RINNAI wall furnace. Electric blankets and hottie bottle also provided. GEOTHERMAL activity - Honey Pai Cottage is in close proximity to the famous Pohutu Geyser, which drifts across the road, so you will smell the sulphur for sure!. You can also see the plumes of steam rising up in the distance - a geothermal wonderland. FOUNDATIONS - Rotorua is a volcanic town and our homes and buildings are built on pumice. These are fine porous tiny little pebbles. They transmit vibrations readily so when a truck goes by, the house may shake. It's definitely not a quake, it's just a truck. So just hold on and enjoy the ride. Mauri ora! I moved to Rotorua and Lake Rotoiti which is where my Maori grandmother, my kuia comes from. I am of Te Arawa descent. These are the Rotorua people. My koro on my father's side is from Northumberland and my kuia is from Ullapool, a McLean. I worked as an osteopath and naturopath for many years. I write about our wildlife in Aotearoa in order to bring it to one's consciousness so that we understand how to look after Papatuanuku - Mother Earth. I am a Maori Spiritual Warrior foremost. I enjoy sharing my knowledge and connections. I am currently renovating a tiny cabin and planning and designing a TINY HOUSE ON WHEELS. 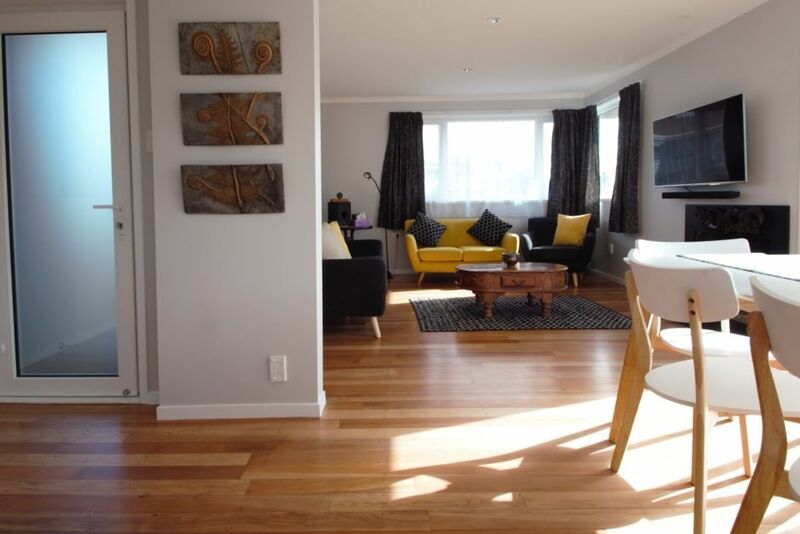 I chose this property because my grandmother's people are from Rotorua. I wanted to be close to my family and my wider whanau. My great grandmother and great great grandmother were early pioneers in the Whakarewarewa Living Maori Village, just a block away. There I can cook my food (although I've not done it yet and have only tasted my neighbours - yummy) in the village's dedicated cooking hot pool. That food is incredible to taste. I really appreciate the way the GUIDES are so realistic and authentic when hosting our manuhiri, our visitors. Pohutu Geyser, Whakarewarewa Maori Village, Te Puia a short walk away. Redwood Forest with a secret I would like you to find out. But you have to do it at night. GEOTHERMAL activity - Honey Pai Cottage is in close proximity to the famous Pohutu Geyser, which drifts across the road, so you will smell the sulphur for sure!. You can also see the plumes of steam rising up in the distance - a geothermal wonderland. FOUNDATIONS - Rotorua is a volcanic town and our homes and buildings are built on pumice. These are fine porous tiny little pebbles. They transmit vibrations readily so when a truck goes by, the house may shake. It's definitely not a quake, it's just a truck. So just hold on and enjoy the ride. Mauri ora! A Powerful modern gas wall furnace located in Dining area. Please leave $5 per hour in honesty box. Lovely house, very convenient location. The house was very clean and nicely arranged. Candice made the house very welcoming and answered texts very promptly. Well presented house in which the owner has put a lot of thought into making your stay as comfortable as possible. Great location for riding in the redwoods forest and the secure under house storage was ideal for keeping the bikes in. The added luxury of the hot tub was wonderful after a day exploring Rotorua! Only downside to the property is that it is close to a busy road and the passing trucks (which start pretty early) shake the whole house. Otherwise we had a great stay in this property and would recommend it to others. Great location, close to the Redwood Forest. It has a nice big fenced yard for the dogs. It was awesome to have a hot spa at the end of the day as well.